Be not you therefore like unto them: (as the hypocrites do in the synagogues and in the streets, that they may have glory of men. Truly I say unto you, They have their reward), for your Father knows what things you have need of, before you ask him. 6 But you, when you pray, enter into your closet, and when you have shut your door, pray to your Father which is in secret; and your Father which sees in secret shall reward you openly. 7 But when you pray, use not vain repetitions, as the heathen do: for they think that they shall be heard for their much speaking. 8 Be not you therefore like unto them: for your Father knows what things you have need of, before you ask him. 9 After this manner therefore pray you: Our Father which are in heaven, Hallowed be your name. 10 Your kingdom come, Your will be done in earth, as it is in heaven. 13 And lead us not into temptation, but deliver us from evil: For yours is the kingdom, and the power, and the glory, for ever. Amen. 15 But if you forgive not men their trespasses, neither will your Father forgive your trespasses. 16 Moreover when you fast, be not, as the hypocrites, of a sad countenance: for they disfigure their faces, that they may appear unto men to fast. Truly I say unto you, They have their reward. 18 That you appear not unto men to fast, but unto your Father which is in secret: and your Father, which sees in secret, shall reward you openly. 22 The light of the body is the eye: if therefore your eye be single, your whole body shall be full of light. 23 But if your eye be evil, your whole body shall be full of darkness. If therefore the light that is in you be darkness, how great is that darkness! 24 No man can serve two masters: for either he will hate the one, and love the other; or else he will hold to the one, and despise the other. You cannot serve God and mammon [mammonos – things other than God in which a person places their trust]. 12 Set up the standard [nec – the pole the LORD is raised on – as in Numbers 21:8 & 9] upon the walls of Babylon [man’s confusion, which is destroying the earth], make the watch strong, set up the watchmen, prepare the ambushes: for the LORD has both devised and done that which he spoke against the inhabitants of Babylon. 13 O you that dwells upon many waters, abundant in treasures [in mammonos], your end is come, and the measure of your covetousness. 16 When he utters his voice, there is a multitude of waters in the heavens; and he causes the vapors to ascend from the ends of the earth: he makes lightning with rain, and brings forth the wind out of his treasures. 23 I will also break in pieces with you the shepherd and his flock; and with you will I break in pieces the husbandman and his yoke of oxen; and with you will I break in pieces captains and rulers. 24 And I will render unto Babylon and to all the inhabitants of Chaldea [those who use their lies and deceptions to manipulate God’s people into not seeing Him] all their evil that they have done in Zion in your sight, says the LORD. 25 Behold, I am against you, O destroying mountain, says the LORD, which destroy all the earth: and I will stretch out mine hand upon you, and roll you down from the rocks, and will make you a burnt mountain. 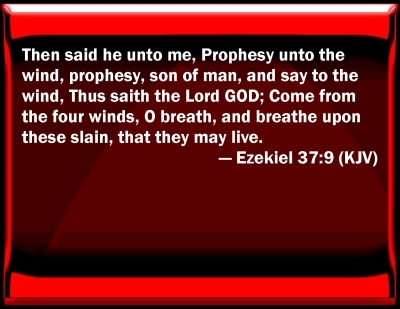 The “wind” the LORD brings against the confusion is the Hebrew word ruwach, and is the same spoken of as Chapter 51 begins. 3 Against him that bends let the archer bend his bow, and against him that lifteth himself up in his brigandine: and spare you not her young men; destroy you utterly all her host. 6 Flee out of the midst of Babylon, and deliver every man his soul: be not cut off in her iniquity; for this is the time of the LORD’s vengeance; he will render unto her a recompense. 7 Babylon has been a golden cup in the LORD’s hand, that made all the earth drunken: the nations have drunken of her wine; therefore the nations are mad. 9 We would have healed Babylon, but she is not healed: forsake her, and let us go every one into his own country: for her judgment reaches unto heaven, and is lifted up even to the skies. 11 Make bright the arrows; gather the shields: the LORD has raised up the spirit of the kings of the Medes [the people of the middle land]: for his device is against Babylon, to destroy it; because it is the vengeance of the LORD, the vengeance of his temple. Friends, the ruwach is the LORD’s will at work by His Holy Spirit moving all things in the direction of the Almighty’s plan and purpose (salvation and righteousness). It is in the wind of verses 1 & 16 above, and it is the “spirit” of kings the Medes (meday – middle land), which destroy the images created to replace God. It is the word “breath” in verse 17, which is saying there is no life-giving plan of salvation to be found in the brutish knowledge of these confounded (confused) men and their images. God’s Spirit only does what works all things together “for good to them that love God, to them who are the called according to his purpose.” This fact is the unchangeable character of God. The first time ruwach is used is Genesis 1:2 describing the creation movement of God’s Holy Spirit, again as now, on the waters of the deep, and from this comes light (understanding), which is separated from the darkness (confusion and brutish knowledge). 10 But the day of the LORD will come as a thief in the night; in the which the heavens shall pass away with a great noise, and the elements [stoicheion – foundational ideas – the damnable heresies spoken of above] shall melt with fervent heat, the earth also and the works that are therein shall be burned up. 12 Looking for and hasting unto the coming of the day of God, wherein the heavens being on fire shall be dissolved, and the elements [stoicheion] shall melt with fervent heat? We know Peter, in 2 Peter 1, describes the same “remembrance” he speaks of in 2 Peter 3:1 above. He is telling of the creation of light, as the LORD moves upon Holy men he chooses, and this understanding is as the day star rising in our hearts (reasoning minds). 9 But he that lacks these things [the LORD’s knowledge] is blind, and cannot see afar off, and has forgotten that he was purged from his old sins. 11 For so an entrance shall be ministered unto you abundantly into the everlasting kingdom of our LORD and Savior Jesus Christ. 20 Knowing this first, that no prophecy of the scripture is of any private interpretation [they are meant to be used by God as He wills, for salvation and to produce righteousness]. The next use of the words is in Jeremiah 4:23 where they are again translated “without form, and void,” again describing the earth as seen by the LORD. In the chapter, we see many of the elements of the LORD’s knowledge, which we have learned from His teaching us morning by morning, precept upon precept, line upon line. 3 For thus says the LORD to the men of Judah and Jerusalem, Break up your fallow ground, and sow not among thorns. 6 Set up the standard [nec] toward Zion: retire, stay not: for I will bring evil from the north, and a great destruction. 7 The lion is come up from his thicket, and the destroyer of the Gentiles is on his way; he is gone forth from his place to make your land desolate; and your cities shall be laid waste, without an inhabitant. 12 Even a full wind [ruwach] from those places shall come unto me: now also will I give sentence against them. 21 How long shall I see the standard [nec], and hear the sound of the trumpet? 23 I beheld the earth, and, lo, it was without form [tohuw], and void [bohuw]; and the heavens, and they had no light. 30 And when you are spoiled, what will you do? Though you clothe yourself with crimson, though you deck yourself with ornaments of gold, though you rent your face with painting, in vain shall you make yourself fair; your lovers will despise you, they will seek your life. … Shall I be enquired of by you, O house of Israel? As I live, says the LORD God, I will not be enquired of by you. 39 As for you, O house of Israel, thus says the LORD God; Go you, serve you every one his idols, and hereafter also, if you will not hearken unto me: but pollute you my holy name no more with your gifts, and with your idols. 40 For in mine holy mountain, in the mountain of the height of Israel, says the LORD God, there shall all the house of Israel, all of them in the land, serve me: there will I accept them, and there will I require your offerings, and the first-fruits of your oblations, with all your holy things. 15 All things that the Father has are mine: therefore said I, that he shall take of mine, and shall shew it unto you. 17 Then said some of his disciples among themselves, What is this that he saith unto us, A little while, and you shall not see me: and again, a little while, and you shall see me: and, Because I go to the Father? 18 They said therefore, What is this that he says, A little while? we cannot tell what he says. 19 Now Jesus knew that they were desirous to ask him, and said unto them, Do you enquire among yourselves of that I said, A little while, and you shall not see me: and again, a little while, and you shall see me? 20 Truly, truly, I say unto you, That you shall weep and lament, but the world shall rejoice: and you shall be sorrowful, but your sorrow shall be turned into joy. 21 A woman when she is in travail has sorrow, because her hour is come: but as soon as she is delivered of the child, she remembers no more the anguish, for joy that a man is born into the world [who she sees]. 22 And you now therefore have sorrow: but I will see you again, and your heart shall rejoice, and your joy no man taketh from you. 25 These things have I spoken unto you in proverbs: but the time comes, when I shall no more speak unto you in proverbs, but I shall [now] shew you plainly of the Father. 33 These things I have spoken unto you, that in me you might have peace. In the world you shall have tribulation: but be of good cheer; I have overcome the world.